This is a concept image for a procedurally-generated gas-giant-like planet in the game. 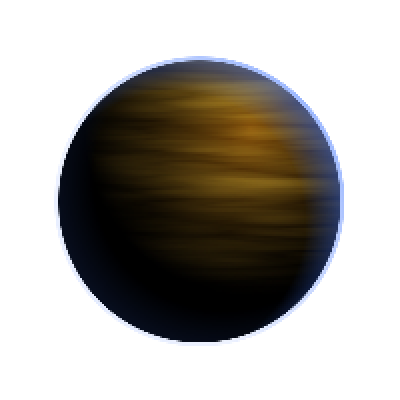 Right now, planets are rendered as a single circle filled with a radial gradient that is offset from its center. This is pretty effective for giving the illusion of a sphere, but it’s a boring non-textured sphere. Currently what I’d need to add to the game would be an extra layer or two of inverted radial gradients for “atmosphere effects” (the blue lighting) and an overlay texture that is either canned or also procedurally-generated. When I figure out how to do this I’ll make a technical post explaining my technique. Oh and yeah, I realize that the lighting is unrealistic — gas giants have clouds that align perpendicular to their axis of rotation, which corresponds to their axis of orbit around their star. Unless the axis of the planet got thrown off bigtime — which does occasionally happen with planets like Uranus — it doesn’t really make sense. Our camera would have to have been rotated, too. This is a concept image for a procedurally-generated gas-giant-like planet in the game. You probably see this dude over on the left right now, too, but I wanted to talk briefly about it. That reminds me; while I wont be going to great lengths to make the game universe realistic, I’ll try to keep them somewhat-correct. More on that later. First screen shot of Island Hopping. The artwork will be replaced in the final version. The basic idea is to fly around and rescue people from rising waters and exploding volcanoes, and whatever other islandy things I have time for. It uses chipmunk for physics and Gamebox and Rubygame. Well after an incredible amount of work I have finally released my first Flash / ActionScript 2.0 game! You can play it here if you’d like. I hope it is cool to post here because it is relevant in that the original game play idea came from my Cryptid Puzzle Challenge entry in the Mini-Ludum Dare #7 competition back at the beginning of the month. I also wanted to really share it all with my buds here at Ludum Dare! TurnStyle is a unique visual and memory based puzzle game where each of the 15 puzzles are original illustrations that follow a complete story arc over the duration of the game. Every puzzle is made up of individual pieces which have been randomly rotated so that they are scrambled each time. You must work quickly and efficiently to rotate the individual pieces into the proper alignment before the timer runs out. There are easy, medium, and hard difficulty puzzles mainly guided by the amount of individual image pieces that make up each puzzle and the way that I break up the images into pieces. Personal best records are stored locally for score and rotation count per puzzle. Global high scores may be submitted to the Mochi Leaderboards at any puzzle progress screen. You are able to retry a level if the time runs out. I haven’t submitted it to any portals or whatnot yet so it is living at it’s mochi-ads home right now. I’m using their encryption, version control platform, advert api, and leaderboards/facebook api. Seems pretty easy to setup. I will try to post more about my adventure in creating this game and learning Flash over at my personal site but for now this is finished! 20 queries executed in 0.097 seconds.